Tag Archives: J.R. (1974). Fifty years progress in soil physics. Mr Gove’s major problem: Why Pisa ranks are wrong. Item Response Theory plays a pivotal role in the methodology of the PISA international league table. This essay refutes the claim that item response theory is a settled, well-reasoned approach to educational measurement. It may well be settled amongst quantitative psychologists, but I doubt if there is a natural scientist on the planet who would accept that one can measure mental attributes in a manner which is independent of the measuring instrument (a central claim of item response theory). It will be argued below that psychology’s approach to the twin notions of “quantity” and “measurement” has been controversial (and entirely erroneous) since its earliest days. It will be claimed that the item response methodolology, in effect, misuses the two fundamental concepts of quantity and measurement by re-defining them for its own purposes. In fact, the case will be made that PISA ranks are founded on a “methodological thought disorder” (Michell, 1997). Given the concerns of such a distinguished statistician as Professor David Spiegelhalter, the Department of Education’s continued endorsement of PISA is difficult to understand. This essay extends the critique of PISA and item response theory beyond the concerns of Spiegelhalter to the very data from which the statistics are generated. Frederick Lord (1980, p. 227-228), the father of modern psychological measurement, warned psychologists that when applied to the individual test-taker, item response theory produces “absurd” and “paradoxical” results. Given that Lord is one of the architects of item response theory, it is surprising that this admission provoked little or no debate among quantitative psychologists. Are politicians and the general public aware that item response theory breaks down when applied to the individual? Unlike psychology, Newtonian measurement has very precise definitions of “quantity” and “measurement” which item response theorists simply ignore. This can have only one interpretation, namely, that the numerals PISA attaches to the education systems of countries aren’t quantities, and that PISA doesn’t therefore “measure” anything, in the everyday sense of that word. I have argued elsewhere that item response theory can escape these criticisms by adopting a quantum theoretical model (in which the notions of “quantity” and “measurement” lose much of their classical transparency). However, that would involve rejecting one of the central tenets of item response theory, namely, the independence of what is measured from the measuring instrument. Item response theory has no route out of its conceptual difficulties. This represents a conundrum for the Department of Education. In endorsing PISA, the Department is, in effect, supporting a methodology designed to identify shortcomings in the mathematical attainment of pupils, when that methodology itself has serious mathematical shortcomings. On his better days William James was a determined optimist, but he harboured his doubts about psychology. He once declared, “There is no such thing as a science of psychology,” and added “the whole present generation (of psychologists) is predestined to become unreadable old medieval lumber, as soon as the first genuine insights are made.” I have indicated my belief that, a century later, James’s less optimistic vision has materialised and that it may be time to bury scientific psychology, at least as a single coherent undertaking. I will demonstrate in a follow-up paper to this essay, an alternative approach which solves the measurement problem as Stevens presents it, but in a manner which is perfectly in accord with contemporary thinking in the natural sciences. None of the seemingly intractable problems which attend item response theory trouble my account of measurement in psychology. However, my solution renders item response theory conceptually incoherent. In passing it should be noted that some have sought to conflate my analysis with that of Svend Kreiner, suggesting that my concerns would be assuaged if only PISA could design items which measured equally from country to country. Nothing could be further from the truth; no adjustment in item properties can repair PISA or item response theory. No modification of the item response model would address its conceptual difficulties. The essay draws heavily on the research of Joel Michell (1990, 1997, 1999, 2000, 2008) who has catalogued, with great care, the troubled history of the twin notions of quantity and measurement in psychology. The following extracts from his writings, in which he accuses quantitative psychologists of subverting science, counter the assertion that item response theory is an appropriate methodology for international comparisons of school systems. From the early 1900s psychologists have attempted to establish their discipline as a quantitative science. In proposing quantitative theories they adopted their own special definition of measurement and treated the measurement of attributes such as cognitive abilities, personality traits and sensory intensities as though they were quantities of the type encountered in the natural sciences. Alas, Michell (1997) presents a carefully reasoned argument that psychological attributes lack additivity and therefore cannot be quantities in the same way as the attributes of Newtonian physics. Consequently he concludes: “These observations confirm that psychology, as a discipline, has its own definition of measurement, a definition quite unlike the traditional concept used in the physical sciences” (p. 360). Boring (1929) points out that the pioneers of psychology quickly came to realise that if psychology was not a quantitative discipline which facilitated measurement, psychologists could not adopt the epithet “scientist” for “there would … have been little of the breath of science in the experimental body, for we hardly recognise a subject as scientific if measurement is not one of its tools” (Michell, 1990, p. 7). If a quantitative scientist (i) believes that measurement consists entirely in making numerical assignments to things according to some rule and (ii) ignores the fact that the measurability of an attribute presumes the contingent … hypothesis that the relevant attribute possesses an additive structure, then that scientist would be predisposed to believe that the invention of appropriate numerical assignment procedures alone produces scientific measurement. Historically, Fechner (1860) – who coined the word “psychophysics” – is recognised as the father of quantitative psychology. He considered that the only creditworthy contribution psychology could make to science was through quantitative approaches and he believed that reality was “fundamentally quantitative.” His work focused on the instrumental procedures of measurement and dismissed any requirement to clarify the quantitative nature of the attribute under consideration. His understanding of the logic of measurement was fundamentally flawed in that he merely presumed (under some Pythagorean imperative) that his psychological attributes were quantities. Michell (1997) contends that although occasional criticisms were levied against quantitative measurement in psychology, in general the approach was not questioned and became part of the methodology of the discipline. Psychologists simply assumed that when the study of an attribute generated numbers, that attribute was being measured. The first official detailed investigation of the validity of psychological measurement from beyond its professional ranks was conducted – under the auspices of the British Association for the Advancement of Science – by the Ferguson Committee in 1932. The non-psychologists on the committee concluded that there was no evidence to suggest that psychological methods measured anything, as the additivity of psychological attributes had not been demonstrated. Psychology moved to protect its place in the academy at all costs. Rather than admitting the error identified by the committee and going back to the drawing board, psychologists sought to defend their modus operandi by attempting a redefinition of psychological measurement. Stevens’ (1958, p. 384) definition that measurement involved “attaching numbers to things” legitimised the measurement practices of psychologists who subsequently were freed from the need to test the quantitative structure of psychological predicates. Michell (1997, p. 356) declares that presently many psychological researchers are “ignorant with respect to the methods they use.” This ignorance permeates the logic of their methodological practices in terms of their understanding of the rationale behind the measurement techniques used. The immutable outcome of this new approach to measurement within psychology is that the natural sciences and psychology have quite different definitions of measurement. Michell (1997, p. 374) believes that psychology’s failure to face facts constitutes a “methodological thought disorder” which he defines as “the sustained failure to see things as they are under conditions where the relevant facts are evident.” He points to the influence of an ideological support structure within the discipline which serves to maintain this idiosyncratic approach to measurement. He asserts that in the light of commonly available evidence, interested empirical psychologists recognise that “Stevens’ definition of measurement is nonsense and the neglect of quantitative structure a serious omission” (Michell, 1997, p. 376). To make my case, let me first make two fundamental points which should shock those who believe that the OECD is using what is acknowledged as the best available methodology for international comparisons. Both of these points should concern the general public and those who support the OECD’s work. First, the numerals that PISA publishes are not quantities, and second, PISA tables do not measure anything. The physical properties and field behaviour of soil depends on particle size and shape, porosity, hydrogen iron concentration, material flora, and water content and hygroscopy. No single figure can embody itself in a constellation of values of all these variables in any single real instance … psychologists would nevertheless like us to believe that such considerations as these do not apply to them. Quantitative psychology, since its inception, has modelled itself on the certainty and objectivity of Newtonian mechanics. The numerals of the PISA tables appear to the man or woman in the street to have all the precision of measurements of length or weight in classical physics. But, by Newtonian standards, psychological measurement in general, and item response theory in particular, simply have no quantities, and do not “measure,” as that word is normally understood. How can this audacious claim to “measure” the quality of a continent’s education provision and report it in a single number be justified? The answer, as has already been pointed out, is to be found in the fact that quantitative psychology has its own unique definition of measurement, which is that “measurement is the business of pinning numbers on things” (Stevens, 1958, p. 384). With such an all-encompassing definition of measurement, PISA can justify just about any rank order of countries. But this isn’t measurement as that word is normally understood. This laissez faire attitude wasn’t always the case in psychology. It is clear that, as far back as 1905, psychologists like Titchener recognised that his discipline would have to embrace the established definition of measurement in the natural sciences: “When we measure in any department of natural science, we compare a given measurement with some conventional unit of the same kind, and determine how many times the unit is contained in the magnitude” (Titchener, 1905, p. xix). Michell (1999) makes a compelling case that psychology adopted Stevens’ ultimately meaningless definition of measurement – “according to Stevens’ definition, every psychological attribute is measurable” (Michell, 1999, p. 19) – because they feared that their discipline would be dismissed by the “hard” sciences without the twin notions of quantity and measurement. The mathematical symbolism in the next paragraph makes clear the contrast between the complete absence of rigorous measurement criteria in psychology and the onerous demands placed on the classical physicist. An essential step in establishing the validity of the concepts “quantity” and “measurement” in item response theory is an empirical analysis centred on Hölder’s conditions. The reader will search in vain for evidence that quantitative psychologists in general, and item response theorists in particular, subject the predicate “ability” to Hölder’s conditions. This is because the definition of measurement in psychology is so vague that it frees psychologists of any need to address Hölder’s conditions and permits them, without further ado, to simply accept that the predicates they purport to measure are quantifiable. This essay has sought to challenge the Department of Education’s claim that in founding its methodology on item response theory, PISA is using the best available methodology to rank order countries according to their education provision. As Sir Peter Medawar makes clear, any methodology which claims to capture the quality of a country’s entire education system in a single number is bound to be suspect. If my analysis is correct PISA is engaged in rank-ordering countries according to the mathematical achievements of their young people, using a methodology which itself has little or no mathematical merit. Item response theorists have identified two broad interpretations of probability in their models: the “stochastic subject” and “repeated sampling” interpretations. Lord has demonstrated that the former leads to absurd and paradoxical results without ever investigating why this should be the case. Had such an investigation been initiated, quantitative psychologists would have been confronted with the profound question of the very role probability plays in psychological measurement. Following a pattern of behaviour all too familiar from Michell’s writings, psychologists simply buried their heads in the sand and, at Lord’s urging, set the stochastic subject interpretation aside and emphasised the repeated sampling approach. In this way the constitutive nature of irreducible uncertainty in psychology was eschewed for the objectivity of Newtonian physics. This is reflected in item response theory’s “local hidden variables” ensemble model in which ability is an intrinsic measurement-independent property of the individual and measurement is construed as a process of merely checking up on what pre-exists measurement. 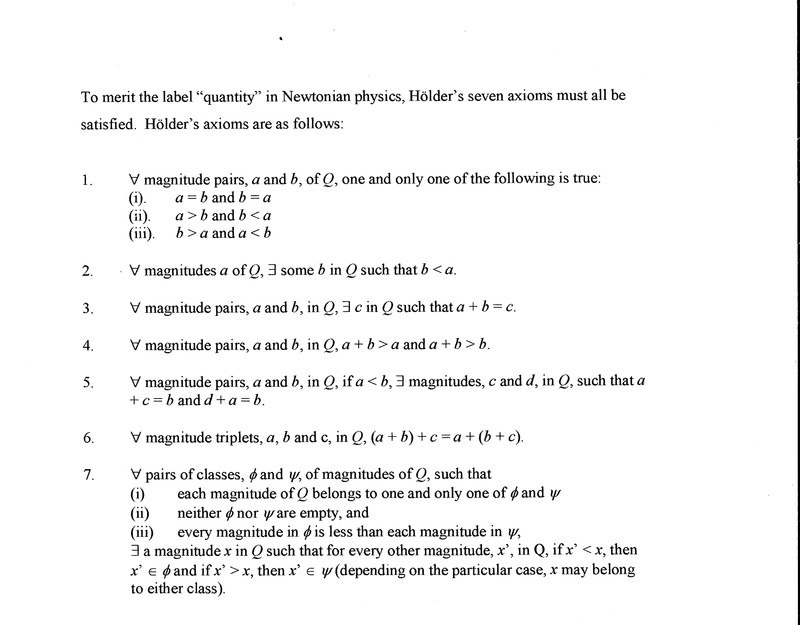 For this to be justified, Hölder’s seven axioms must apply. Boring, E.G. (1929). A history of experimental psychology. New York: Century. Borsboom, D., Mellenbergh, G.J., & van Heerden, J. (2003). The theoretical status of latent variables. Psychological Review, 110(2), 203-219. Gardner, H. (2005). Scientific psychology: Should we bury it or praise it? In R.J. Sternberg (Ed. ), Unity in psychology (pp. 77-90). Washington DC: American Psychological Association. Lord, F.M. (1980). Applications of item response theory to practical testing problems. Hilldale, NJ. : Lawrence Erlbaum Associates, Publishers. Medawar, P.B. (1982). Pluto’s republic. Oxford University Press. Michell, J. (1990). An introduction to the logic of psychological measurement. Hillsdale, NJ: Lawrence Erlbaum Associates, Publishers. Michell, J. (1997). Quantitative science and the definition of measurement in psychology. British Journal of Psychology, 88, 353-385. Michell, J. (1999). Measurement in psychology: A critical history of a methodological concept. Cambridge: Cambridge University Press. Michell, J. (2000). Normal science, pathological science and psychometrics. Theory and Psychology, 10, 639-667. Michell, J. (2008). Is psychometrics pathological science? Measurement: Interdisciplinary Research and Perspectives, 6, 7-24. Oppenheimer, R. (1956). Analogy in science. The American Psychologist, 11, 127-135. Philip, J.R. (1974). Fifty years progress in soil physics. Geoderma, 12, 265-280. Ross, S. (1964). Logical foundations of psychological measurement. Copenhagen: Munksgaard. Rozeboom, W.W. (1966). Scaling theory and the nature of measurement. Synthese, 16, 170-223. Stevens, S.S. (1958). Measurement and man. Science, 127, 383-389. Titchener, E.B. (1905). Experimental psychology: A manual of laboratory practice, vol. 2. London: Macmillan.